The bad news for Paris St-Germain is that they will be without their four key players in the midfield and forward positions going into 15th April's 1st leg clash. Defenders David Luiz and Thiago Motta will be out for for four weeks and 10 days respectively having suffered injuries in PSG's Ligue 1 clash with Marseille on Sunday. Central midfielder Marco Verratti and club talisman Zlatan Ibrahimovic are presently on suspension.The good news is that PSG will be playing at home in Parc Des Princes. PSG have remained unbeaten in 34 home games and have in fact beaten Barcelona in Paris 3-2 in one of their Champions Cup group matches last year at this venue. Nevertheless Laurent Blanc will have a lot of filling in to do in the absence of his 4 regular players. Motta's place at the frontal position of the back four will likely be taken up by Yohan Cabaye and Adrien Rabiot could make up for the midfield absence of Verratti.The central defending spot will likely be filled in by Marquinhos and the job of manning the right-back position will most likely fall on Gregory van der Wiel. The absence of Ibrahimovic would mean that the bulk of attacking work will have to be shouldered by an out-of-form Edinson Cavani with Lucas Moura assisting him upfront. PSG will have to depend on the creativity and craftiness of their Argentine midfielder Javier Pastore to create goal-scoring opportunities. Barcelona were derived from a 10th straight win in all competitions when they drew with Sevilla on Saturday 2-2. But that does not mean that they are not good enough to take on anyone. By their own high standards 2015 has been an exceptional year. Apart from a 0-1 loss to Malaga and the draw with Sevilla they have won all the remaining 21 matches they have played so far this calendar year. They presently lead the La Liga table and are two points ahead of their arch-rivals Real Madrid. The Catalan club's defense has improved dramatically over the months. Marc-Andre ter Stegen the 22-year old German import from Borussia Monchengladbach is the likely choice of Barca's goalkeeper in the 1st leg clash. He has just made 11 appearances for the club in which he has 6 clean sheets and conceded eight. With the Lionel Messi-Luis Suarez-Neymar trio upfront coach Luis Enrique would surely adapt the club's customary "pressing" game to get vital away goals. Messi is still among the goals. Neymar is back in the thick of things with a free-kick goal ending a seven-match La Liga drought. Suarez has been at his been at his opportunistic best. PSG really have a job on their hands in stopping these men from scoring. PSG's last encounter was a morale-boosting 4-0 win over Bastia in the French Coupe de la Ligue final. 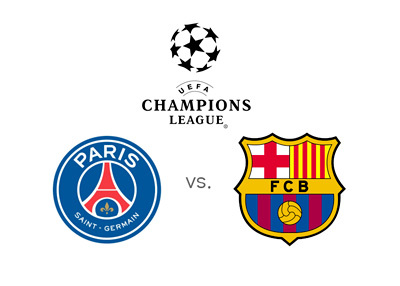 The French club have the depth and talent to get a few past Barcelona at Parc de Paris on April 15th. But how less they can let in will be even more important. Barcelona are familiar opponents of the French giant and one of the very few clubs that know the Catalan's game well. But Barcelona's awesome track-record in critical knock-out games and their knack of scoring goals in away games has weighed on the bookmakers who seem to fancy their chances against the hosts at the Parc de Paris on Wednesday night.